The Kolibree toothbrush, demonstrated at the International CES gadget show in Las Vegas this week, senses how it's moved and can sense how long and how well you brush. It also lets you track your performance on your phone. Armbands that track how much you move have become popular ways to motivate people to get fit. But how fit are your teeth? Are you lazy about brushing them? Never fear: An inventor is on the case. 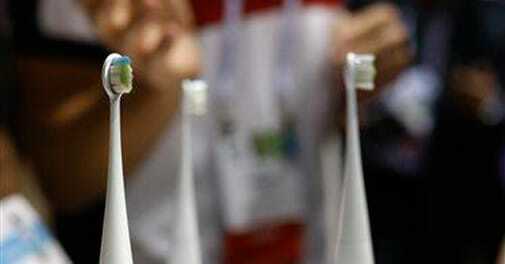 An electric toothbrush senses how long and how well you brush, and it lets you track your performance on your phone. The Kolibree toothbrush, demonstrated at the International CES gadget show in Las Vegas this week, senses how it's moved and can send the information to an Android phone or iPhone via a Bluetooth wireless connection. VIRTUAL DENTIST: The toothbrush will be able to teach you to brush right (don't forget the insides of the teeth!) and make sure you're brushing long enough, says Thomas Serval, the French inventor. "It's kind of like having a dentist actually watch your brushing on a day-to-day basis," Serval says. FUN WITH HYGIENE: The toothbrush will also be able to talk to other applications on your phone , so an enterprising developer could, for instance, create a game controlled by your toothbrush. You could score points for chasing monsters among your teeth. "We try to make it smart but also fun," Serval says. INSPIRATION: Serval says he was inspired by his experience as a father. He would come home from work and ask his kids if they had brushed their teeth. They said "yes," but Serval would find their toothbrush heads dry. He decided he needed a brush that really told him how well his children brushed. AVAILABILITY: The company says the Kolibree will go on sale this summer, for $99 to $199, depending on features. The US is the first target market. THE FUTURE: Serval says that one day, it'll be possible to replace the brush on the handle with a brushing unit that also has a camera. The camera can examine your cavities and tartar while you brush. Forget selfies - the next adventure in self-expression could be close-up guided tours of people's teeth.